A few weeks back we dropped in on some friends late on a Saturday afternoon. They were just heading down to their pear and nectarine trees to harvest all the fruit. Of course we joined them and spent a fun hour chatting and picking fruit. Their pear tree was completely laden down with fruit, and we picked two large washing baskets of pears. As we were leaving they filled a box of pears for us to use. After a bit of a rush to use the peaches up, we are now in pear territory. 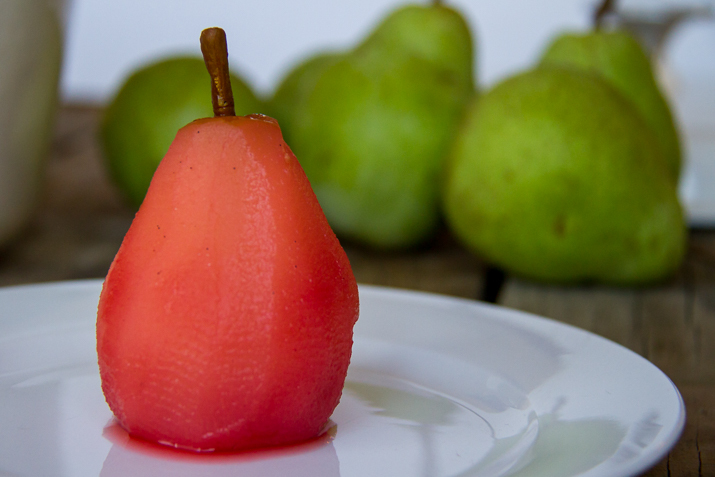 Stay tuned for some pear recipes over the next few weeks! This recipe comes from my mother in law. She made it last July on a freezing cold day and served them hot. The dessert was beautifully sweet and warming. This time we ate them at room temperature with some ice cream. Also yummy! The colour of these pears is amazing! Love them. Place the apple juice, sugar, raspberries, and vanilla paste into a heavy based saucepan. Bring the syrup mixture to just below boiling point. Peel the pears, and place straight into the the hot syrup mixture. This will stop the pear go brown. Poach the pears for about 20 minutes or until tender. Keep the lid on the sauce pan. Turn the pears occasionally so that they get evenly cooked. Serve hot or cold with the syrup and some ice cream or custard. Look at that colour! The kids loved this dessert, and hoovered it down. Got any good pear recipes? Hit me with them. I have a whole box of pears to use! Yes I'm hoping to do just that! It's hard to know what will go the distance/be played with over and over and over again though with the first! Any tips? I'm planning on being pretty specific about first birthday gifts from family as I don't want to start collecting crap that's never played with! When they are little like Eleanor, they have such a short attention span that they seem to go through toys faster. I think if I were at your stage again, I would be choosing the types of toys to invest in carefully now, that way you have a plan, and ideas for when people ask for gift ideas. Love pears. Wrap in pastry with cinnamon and bake. Poach in a gingery syrup if you like ginger. If you use wine, a deep red wine and sugar syrup is good. Poach in syrup with brown sugar to sweeten. Just before serving, stir in some thick cream for a caramel flavour. I rarely eat icecream but would serve with a bit of cream. The ginger recipe is good on a cold night. gorgeous pears. I love simple dishes like this. I never use pears for anything, so no recipes to share, but i do like this one and it looks so easy. 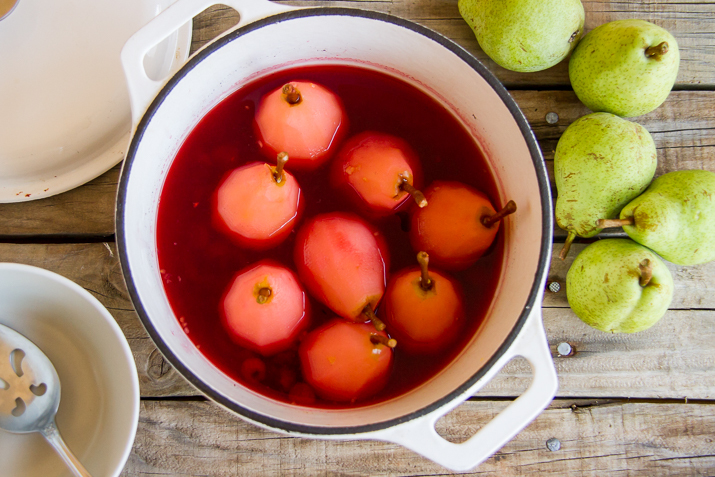 I always thought poached pears was a hard recipe to do – they always seem to struggle with it on 'My Kitchen Rules' anyway!